The lessons listed below are set up as detailed descriptions and photos on my blog pages. The lessons usually span over several posts. You may purchase the photo reference and drawing for many lessons for $5.00 by sending me an email of the title of the lesson you would like. I will post it on my etsy shop for you to purchase, then I will send the pdf files to you. Otherwise you can simply enjoy the lessons via the blog. I love to get feedback, so feel free to share your comments, share with Facebook friends, and stay in touch! I also teach classes in Melbourne, Florida. Please visit Classes and Workshops link above for more details. Video lessons are not in pdf format, but you may view them for free. Just click the link below to see the lesson post. Basic Flat Wash in Watercolor – Video Link – This is a link to my YouTube video. Learn how to create a beautiful flat wash in watercolor… I love to share my tips and tricks with you! Graded Wash in Watercolor – Video Link – This will take you to my YouTube video so you can see the process as I describe it. Fun! Give it a try! Blended Wash in Watercolor – Video Link – This link will take you to my YouTube video. This is a demonstration of a blended wash where two colors are applied next to one another on a watercolor painting. The third in my little video series of wash demonstrations. This wash takes some practice, but is exciting and fun, once learned! Wet-In-Wet Wash in Watercolor – Video Link – This link will take you to my YouTube video demonstration of a wet-in-wash in watercolor. This is one of the most challenging washes to control, but by far the most fun! Watch the demo, then explore, practice and play with colors and the techniques that I show here. Hope you enjoy this one! Push Pull Brush Stroke in Watercolor – Video Link – A quick YouTube video showing this very useful, and basic, brush stroke. Softened Edge Stroke in Watercolor – Video Link – Learn how to create a soft edge from color to clear paper with a round brush. YouTube video shows the technique with simple description and a couple of examples in paintings. Brush Dance Brush Stroke in Watercolor – Video Link – This wonderfully simple brush stroke will help you to create foliage and texture in a very simple way, yet it will look loose, painterly and organic! This is a YouTube video link. How To Paint Trees in Watercolor. Beginner Level. Step-by-step instructions including how to prepare your paper, references, and how to execute the various strokes and washes in watercolor. Photo references and drawings included. How To Paint A Rose in Watercolor. Beginner Level. Step-by-step instructions including how to prepare your paper, references, and how to execute the various strokes and washes in watercolor. Photo references and drawings included. 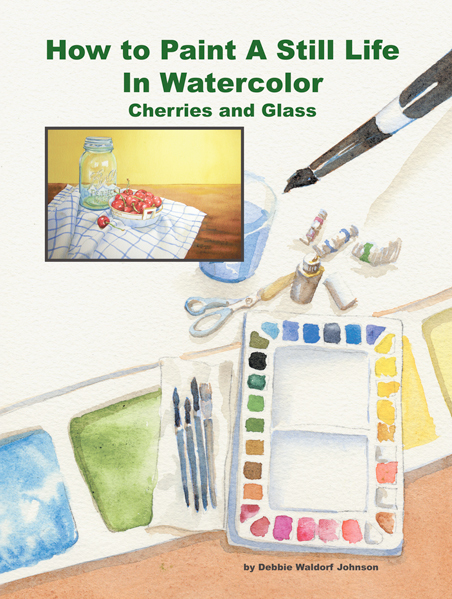 How to Paint a Still Life in Watercolor: Cherries and Glass. Intermediate Level. Step-by-step instructions including how to prepare your paper, references, and how to execute the various strokes and washes in watercolor. Photo references and drawings included. 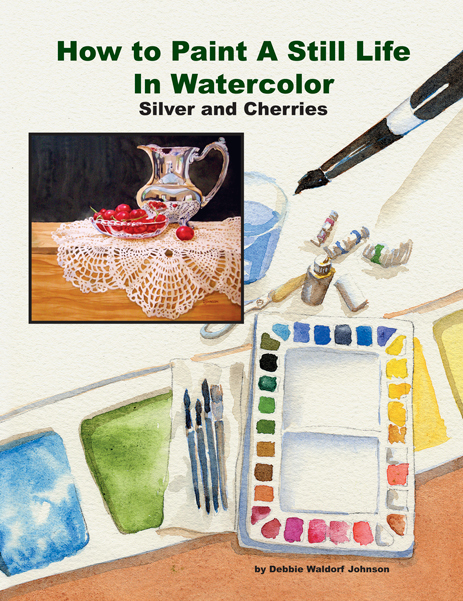 How to Paint a Still Life in Watercolor: Silver and Cherries. Advanced Level. 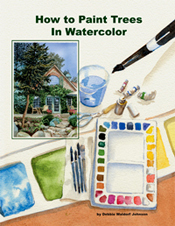 Step-by-step instructions including how to prepare your paper, references, and how to execute the various strokes and washes in watercolor. Photo references and drawings included. How to Paint a Pine Tree – a quick little lesson with photos showing how to create a pine tree in watercolor. No references are needed for this simple and fun lesson. 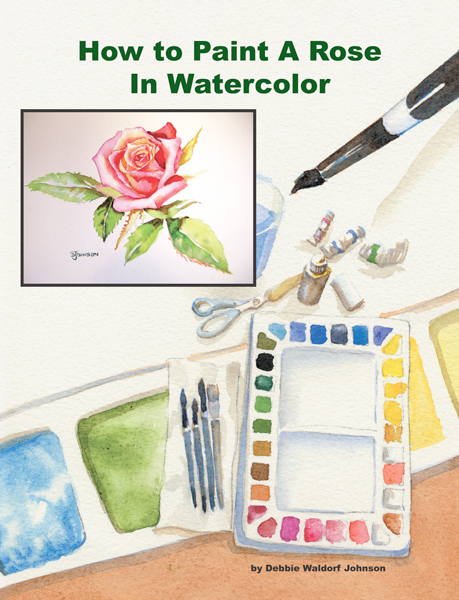 How to Paint a Rose in Watercolor – This is a short lesson that is simple and produces a very pretty end painting. You can order the drawing and photo reference from my etsy site at www.watercolorgirl.etsy.com for $5.00. Just click the Online Class icon and create your order. Then let me know in the message box that you would like the Pink Rose Lesson. I will email the references to you. Water Droplets in Watercolor – This is a short demonstration with explanation of how to create water droplets on a flower in watercolor. Send email to watercolorgirl777@gmail.com, if you would like to purchase the references. Paint Foliage on a Tree in Watercolor – This is a short lesson on painting trees in watercolor. No references available for this simple lesson. Red Geranium Part 1 – To see the complete lesson, look at the posts which follow this installment. Send email to watercolorgirl777@gmail.com, if you would like to purchase the references. River Scene in Watercolor Lesson – Follow along in this first of several posts as we work on a river scene together. References for this lesson are available. 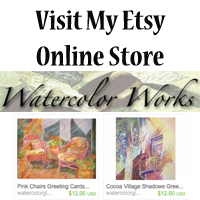 Contact me for more information: watercolorgirl777@gmail.com. Boat on River Lesson – Several posts take you step by step through this little lesson of painting a boat on the river in watercolor. References available through my etsy shop. Send email to watercolorgirl777@gmail.com, if you would like to purchase the references. Palm Tree on Indian River/How to Transfer a Drawing to Watercolor Paper – This is a quick lesson, in a couple of posts, that covers painting a palm tree, water, and one way to transfer a drawing to watercolor paper. References are available. Send email to watercolorgirl777@gmail.com, if you would like to purchase the references for $5.00. How to Paint a Sunflower in Watercolor – This is a wonderful first project for beginners. Watch the Flat Wash and Graded Wash videos above before you begin! References available for $5.00 – just email me for the Sunflower Lesson and I will post it on my etsy shop. Lemons Lesson – Beginning level lesson of a small still life in watercolor is covered in several posts. Set up a small still life of your own and you can follow along and simulate the steps that I used to create this piece, or send me an email at watercolorgirl777@gmail.com, if you would like to purchase the references for $5.00..
Bird of Paradise – Part 1 – This is a description of how I created this painting. This lesson is not yet available in pdf format. Sunlit Coconuts – Fun lesson in painting colorful coconuts in watercolor. Several posts provide detailed instructions. Send email to watercolorgirl777@gmail.com, if you would like to purchase the references for $5.00. Enjoy! Still Life with Cherries Lesson – Paint along with me and create a beautiful still life with shining cherries. References are available for $5.00 – email me and request Still Life with Cherries Lesson. I will post it on my etsy shop for you and you will receive a pdf file of the photo references and the drawing. Flamingo Lesson – In this lesson I cover some basic composition and building a detailed painting in glazes with watercolor. The lesson is spread over several posts. You may purchase the photo references and drawings for $5.00: contact me via email (watercolorgirl777@gmail.com) and I will add the lesson on my etsy online store for you. This is a nice lesson as there are lots of options in the drawings to choose from. Parrot Study – Through several posts I cover how to paint one or two parrots (your choice) in watercolor. The references for this lesson are available. Send email to watercolorgirl777@gmail.com, if you would like to purchase the references for $5.00 through my etsy shop. Arches – This is a great study of a building archway with a few flowers. In this lesson I go over a little color theory also as we paint the shadows first. The lesson spans over several posts and the references are available on my etsy shop – just email me and let me know you would like the Arches lesson. The photo reference and drawing will come to you in a pdf file for a fee of $5.00. Hibiscus in Watercolor Lesson – Fun lesson on a large sheet of watercolor paper. I take you through every step of the process in this piece over several posts. References are available. Contact me via email and let me know which lesson you would like and I will put the photo reference and drawing (pdf format) on my etsy online store for you to purchase for $5.00. Cactus Flower Lesson – Follow along as I take you through the steps of developing this painting. References available – email me and request Cactus Flower Lesson and I will post the references on my etsy shop for you for $5.00. Scooter and Riley – Dogs Lesson – Scooter and Riley are two adorable dogs who are the models for this lesson. This lesson is contained in several posts and the references are available for $5.00 through my etsy online store. Demonstration of Layering Watercolor on Canvas – No references available for this one, but you can follow the posts and see how I prepare the canvas, create my layered, wet watercolors on canvas, and then seal the canvas to protect it. More lessons to come…Let me know if there is some watercolor method in particular you would like to see and I’ll do my best to make it happen. Great lessons..was looking for lessons on painting watercolor roses…found your’s..